Ray Bradbury’s ‘Frost & Fire’: Given only 8 days to live?!?! The Book: “Frost and Fire” by Ray Bradbury. 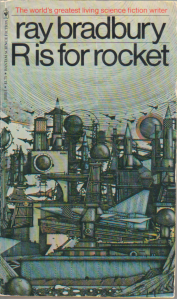 Originally published in 1946 in Planet Stories as “The Creatures that Time Forgot.” The edition read is in R is for Rocket, published by Bantam Books in 1978. The Setting: A distant planet closer to the sun. The Story: A spaceship crashed on a distant planet where night and day are harsh enough to kill within minutes, and only a single hour at dawn and dusk is habitable. The survivors of the spaceship live in caves in cliffs. The extreme radiation has accelerated human life so that a full life cycle is lived in only 8 days. Sim (the main character) is born, grows, and decides to reach a crashed spaceship (a little more than an hour’s run away) or die trying. Why is this interesting to me? In our daily, actual lives we are born, we all have a childhood (if we are fortunate) and we grow into what you see every morning in the mirror. We start as children, impatient and eager to grow mature enough to ‘do it on our own’ and prove our worth. By the time we get old enough to understand and appreciate ‘perspective’ and what is truly significant in this life the brakes come off our ride and we rapidly realize both our mortality and the true worth of time and the importance of those we have been blessed to be surrounded. I read the above short story as an element of required reading in Junior High. A short time ago, nearly 20 years later, I had the opportunity to re-unite with many of my childhood friends for a float trip down in the banjo infested rivers of southern Missouri. Captivatingly, this short story surfaced as a subject of discussion. We had all had more than a few cold beverages and the dialogue revolved around why this wedged in our minds; in a sea of stuff we had been obligated to read. The conversation was interesting to us because life is one of those things that can feel both super long (stuck in traffic for an hour without moving) and super short (losing a friend or family member way before their time). We discussed the thought of condensing every decision… All the good times… All the bad times.. The whole lot down to 8 days. We discussed how now and again it feels as if life has a way of wearing you down like a rock in a river and even the best laid plans can be pushed aside by a continuous onslaught of life’s river rushing its opportunities, worries and hopes right through us. How crazy would it be to know that you only had 8 days to live? In Bradbury’s story the premise is fairly uncomplicated. Eight days is given to you to live from your birth but you are given what they call ‘racial memory’ which allows you to know instantly at birth everything your ancestors have ever known. At birth you are faced with the reality that you will have 8 days if you do absolutely nothing. Naturally there are options, they vary in what will extend or retract from the days that you have been blessed. Purportedly, there is a cave that will allow you to double your life expectancy if you are able to reach it but the risk is great and many have reportedly died well ahead of their expected existence. Not surprisingly, you also have the immense Hail Mary option: a spaceship that reportedly is positioned exactly one hour from the place that you are born. Remember, you only have one hour a day that is even vaguely habitable outside of your current dwelling. If your decision is Hail Mary and you don’t run at full speed for the full hour to reach the spaceship you will surely perish. Your memories aren’t even yours, they are inherited and tell you that this spaceship exists but that evidently no one has ever made it! In my opinion, the parallels between this story and our real life are thoroughly amazing. As with anything if you concentrate or draw out the frames slow enough you will see things that you would have never seen in actual time. How hard would you battle if you knew you only had one day, one hour, maybe just 5 minutes left in your life? In my opinion, complacency and wasted talent are two of the most distressing occurrences that can happen to us as we mature. We confront the usual onset of older age: cranky knees, anxiety we never knew existed just years prior and ever increasing responsibility. My opinion, but I think too often we have succumbed to trying to just survive life as we get older and forget or are just too tired to really keep that passion we once were so effortlessly able to summon. What if we could attack each day like Bradbury’s story? How much would we have accomplished at the end of our relatively long lives if this was our approach? I appreciate it would be tough to fully live a life like that and I am sure it would probably be unhealthy to be that high strung =) I guess my point in all this rambling is I imagine it would be cool if we all just spent more time in thought, thinking a little more about what we contemplated and believed to be essential as naive kids and see if those things aren’t still pretty damn important, maybe even more at present. Global Poverty Stats: Reminder how good we have it in the United States. Thanks for leaving a comment, Mort. Couldn’t agree more, have to push forward! Cheers. John VonBokel on David Foster Wallace…. ourthoughtschilled on David Foster Wallace….